The Los Angeles Mayor made the announcement Tuesday evening at City Hall. Eric Garcetti, the 47-year-old mayor of Los Angeles, announced Tuesday that he will not seek the Democratic nomination for president in 2020. "This is where I want to be, and this is a place where we have so much exciting work to finish," Garcetti said at a press conference at Los Angeles City Hall. "I have decided not to throw my hat in the ring to run for President in 2020." He added, "This was not an easy decision given the extraordinary times that we live in. ... As an American, like so many of us we look to Washington, we look to a government that would be kind and caring, but today we see one that is corrupt and cruel." Garcetti also said he felt "even more sincere" in his decision after seeing the crop of candidates who have already announced their candidacies, including his fellow Californian, Sen. Kamala Harris. "First of all let me say how excited I am for Kamala," Garcetti said, adding that Harris personally called him to say she was running. Garcetti added that Harris' decision did not influence the one he announced Tuesday evening. (Jose Luis Magana/AP) Los Angeles Mayor Eric Garcetti speaks during the U.S. Conference of Mayors meeting in Washington D.C., Jan. 24, 2019. "I said from the beginning that nobody jumping in was what this decision was about," Garcetti said. Another factor in his decision was his confidence in the ability of the growing field of Democrats vying to take on President Donald Trump in 2020. Garcetti said he will do what he can to help them win. "I didn't have a burning desire that I had to be president at all costs, that's not been a life-long dream, this was a moment when I saw somebody who I felt was destroying this country," Garcetti said. "The weaker that he gets and the stronger that our field gets makes me even more confident about the work I can do here. I'll help them -- I'll work very hard." The mayor of America's second most-populous city, Garcetti had been one of the most active potential 2020 candidates over the past year, making trips to the critical, early primary states of Iowa, New Hampshire and South Carolina. At a press conference last week in the nation's capital, Garcetti told reporters to "stay tuned" on a possible presidential announcement, but that his mind had been preoccupied with ending the Los Angeles teachers strike. It finally came to a conclusion earlier this month after the teachers union and city officials reached an agreement. While he is now officially declining to run, Garcetti said he believes nominating a candidate without ties to Washington could be an asset for Democrats in 2020. 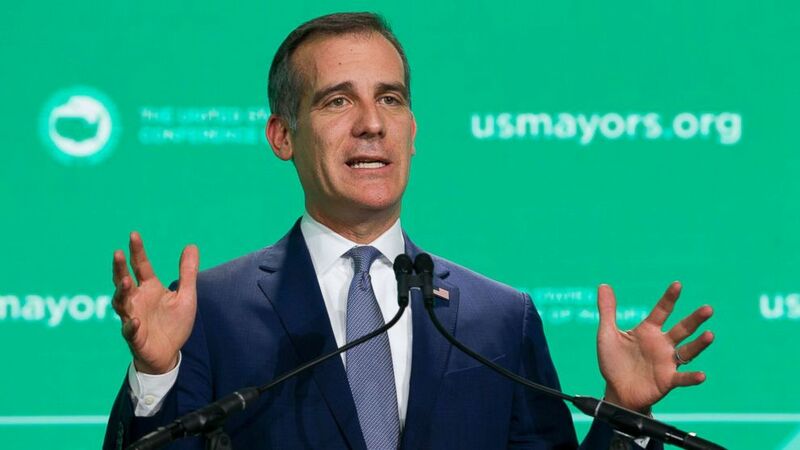 "Right now Americans that live in the real America bring a perspective that is different," Garcetti said last week at the U.S. Conference of Mayors in Washington. "It's not about sending tweets. A victory is not about how many likes you get, a victory is paving a street, opening a factory, is getting real things done." Of the major Democratic candidates that have either announced presidential bids or have taken steps towards one, South Bend, Indiana's Pete Buttigieg is currently the only mayor in the race. Other current and former mayors thought to be mulling presidential bids include New York City's Bill de Blasio and Michael Bloomberg and New Orleans' Mitch Landrieu.